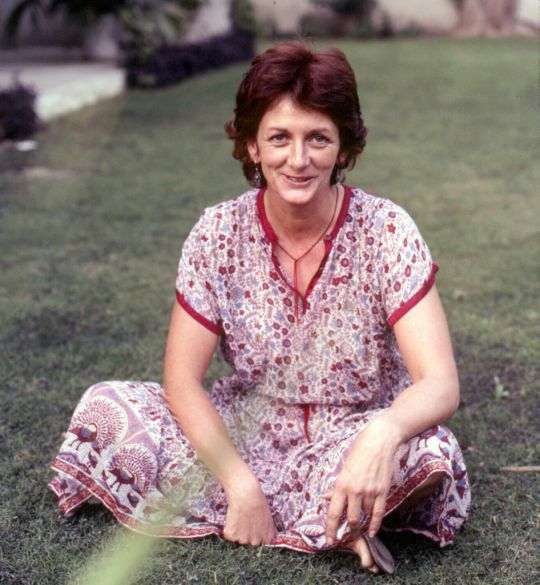 Trisha Donnelly in the front yard of Tushita Mahayana Meditation Centre in the early ’80s, New Delhi, India. Photo courtesy of Lama Yeshe Wisdom Archive. Nicholas Ribush, director of the Lama Yeshe Wisdom Archive, offers this remembrance. Long-time FPMT student Ven. Thubten Labdron (Trisha Donnelly) passed away on December 19, 2015, in Queensland, Australia, due to cancer, with which she had recently been diagnosed. She was 71. Ven. Trisha was born Patricia Hector in Surrey, England, in August 1944, the eldest of six sisters. When she was six her family moved to Malta, where she went to school for three years. They then returned to Petersfield, East Hampshire, where Trisha finished her schooling. After that she became a beatnik, got involved in political causes and worked at Forest Mere Health Hydro, a spa for the rich and famous. While there, she met a friend, Pru, and they lived together in Jersey for a while until they emigrated by ship to Australia in 1964. In Australia Trisha met her future husband Ross Donnelly, and after various adventures in Australia they left for England around 1970, spending a year in India, where they got married, along the way. After staying a while in England they returned to Australia via India again, but eventually separated, and Trisha went back home to regroup. Having developed an interest in Buddhism in India she wanted to return and did so in the mid-’70s. It was there she reconnected with Jamie Johnston, a Scottish guy who she and Ross had met earlier and his Swiss wife, Isabelle. Jamie had been to the Seventh Kopan Course and Isabelle to the Eighth. In between they and Chris and Barbara Vautier had organized Lama Yeshe and Lama Zopa Rinpoche’s first visit to Switzerland in 1975. They had a clothes shop in Geneva and a business office in Civil Lines, old Delhi, near the Ladakh Budh Vihar, and Trisha became their local manager. That’s where I first met Trisha in 1978. I’d been in and out of Delhi for over a year, trying to start Tushita Mahayana Meditation Centre as instructed by Lama Yeshe, and needed somewhere to stay. My friend Sunita Kakaria, who was helping me with Tushita, suggested I try Jamie and Isabelle’s place. It was perfect, so I moved in. 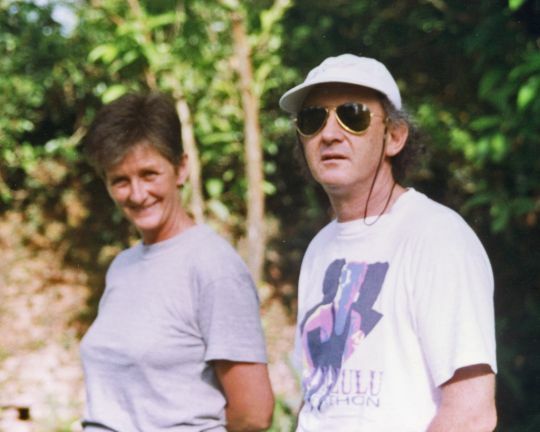 Trisha and I hit it off right away, so when, at the end of that year, the Johnstons decided to shut down their Delhi operation, Trisha agreed to help me establish Tushita and we moved into Sister Max Mathews’ rooms at the old Tibet House at 16 Jor Bagh. 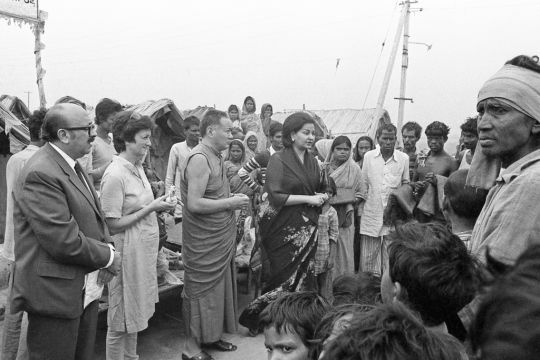 Trisha Donnelly with Lama Yeshe at the Sewa Semiti Leprosy Clinic, India, 1982. Photo by Gregg Moscatt, courtesy of Lama Yeshe Wisdom Archive. Just after we found the ideal house for a center in May 1979, I had to leave for an international teaching tour, so Trisha took responsibility for getting the center going. By the time I got back several months later she had the place running smoothly, with an SPC and an active spiritual program, several guest rooms, and kitchen and office staff. When it was clear we needed another source of income, she established our clothing business, which consisted mainly of her buying used saris (I went on some of these interesting forays) and making them into highly desirable hippie clothing, which we sold in the West. Eventually we exhausted the Delhi market of suitable old saris and had to drive to places like Agra and Jaipur in search of more. It was a very successful business and kept the center solvent. Of the many enduring memories I have of our time together at Tushita, one of my favorites is this. Imagine it’s a hot Sunday morning in New Delhi. The live-in Western staff and guests have gotten up late, had a leisurely breakfast and are sitting feet up under the fans on the back porch. But not Trisha. An auto-rickshaw spewing black smoke pulls up into the driveway and out she jumps, red-faced and sweating, flat hair, hauling a huge bundle of used saris. She’d gotten up early to go to the open-air sari market in back of the Red Fort way over in old Delhi, spent about three hours under the sun bargaining with recalcitrant sari wallahs and made her way back to the center. I remember this because it was just so typical of her dedication, conscientiousness and hard work, doing what had to be done no matter what. We depended so much on the income from these clothes she made. Another of Trisha’s noteworthy accomplishments while at Tushita was learning to drive in the center’s car. One day she came back from her lesson explaining, “Today we learned zigzag driving”! When it came time for her test, the instructor made her wait in the car some distance from the police station and give him 300 rupees. He returned with her license. She was also an excellent writer, editor, copyeditor and proofreader. When we established Tushita’s publishing arm, Mahayana Publications, it was her job to ensure that all the books and other materials we produced were error-free and she did that really well. His Holiness the Dalai Lama with Trisha at the Tushita Mahayana Meditation Centres’ second Dharma celebration, New Delhi, India, 1982. Photo courtesy Lama Yeshe Wisdom Archive. All this was possible because of Trisha’s dedication and hard work, and with all my coming and going, I couldn’t have run the center without her. Group photo from the1984 CPMT meeting in England. Trisha, in a grey sweater, is standing in the back row. Photo courtesy of Lama Yeshe Wisdom Archive. 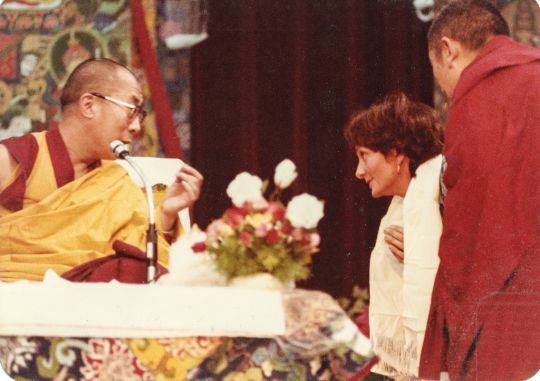 After Lama sent me to London to take over Wisdom Publications in 1983, Trisha stayed on at Tushita until she went to Dharamsala to do retreat. 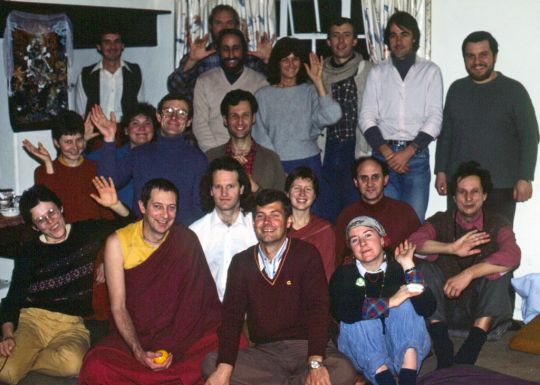 Also that year, Lama Yeshe named her to the inaugural FPMT board of directors. In 1986 she was part of the small group that accompanied Lama Zopa Rinpoche on his first trip to Tibet since he’d left in 1959. After that she lived at Kopan for several years doing ngöndro practices and working in the monastery clinic taking care of the young monks. She also worked for the Maitreya Project for a couple of years while living at Kopan. In September 1998 she received an email from Ven. Roger Kunsang requesting her on behalf of Lama Zopa Rinpoche to become the director of Root Institute in Bodhgaya, India, saying, “You can have your own armored car and 43 bodyguards and, of course, at a call the FPMT Air Force will swing into action.” Accordingly, Trisha moved to Bodhgaya in February 1999. The details of Trisha’s extensive works during two terms as director of Root may be found here. On December 31, 2003, the last day of her first term at Root Institute, she received rabjung vows from Lama Zopa Rinpoche and became Ven. Thubten Labdron, and a couple of weeks later received her getsül vows from Denma Lochö Rinpoche. She then went to California to live in Rinpoche’s Aptos house, and we began working together again as she started checking transcripts and collating Rinpoche’s lam-rim teachings for the Lama Yeshe Wisdom Archive, work that she did on and off until she passed away. 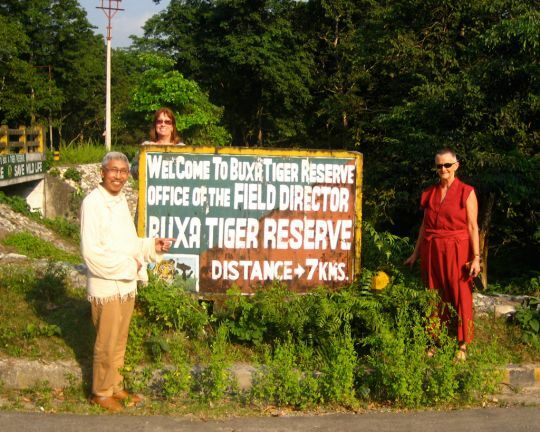 She also did a research trip to the former refugee camp at Buxa Duar in West Bengal on behalf of the Archive and our work on Big Love: The Life and Teachings of Lama Yeshe. In 2007 she returned to Bodhgaya for a second term as director of Root Institute. Among her many accomplishments this time were starting the Tara Children’s Project, an orphanage for HIV-affected children, continuing Root’s animal liberation project, reopening the Maitreya Project School, building the Nagarjuna statue, inaugurating the Garden of Stupas Project and initiating the Festival of Lights and Merit Project. In addition, of course, she did all the other things that the director of a busy FPMT center has to do to keep the place running. Ven. Trisha and Ven. 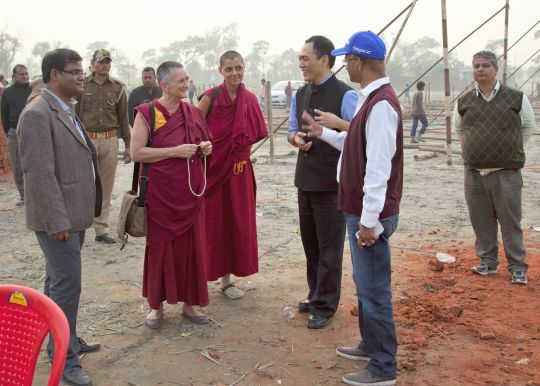 Samten with District Magistrate Rigzin Samphel visiting the ceremony site as it is being built, Kushinagar, India, December 9, 2013. Photo by Andy Melnic. She was then due to move to Nepal to start working full time for the Archive, but before doing that she wanted to visit friends in Australia. It was there that she was unexpectedly diagnosed with terminal cancer, and she decided to remain in Australia to die. She stayed near Chenrezig Institute, being looked after by Sangha and lay friends, and spent her last hours at Dove Cottage, a hospice in Caloundra. When Ven. Trisha took her last breath, Ven. Yeshe Khadro (YK) was with her and on Skype with Ven. Holly Ansett, who was with Rinpoche in India. Rinpoche immediately began doing prayers for Ven. Trisha and YK was able to administer a holy relic pill that Rinpoche had offered. On December 20 a Guru Puja with tsog was offered at Kopan House at Sera Monastery in India. 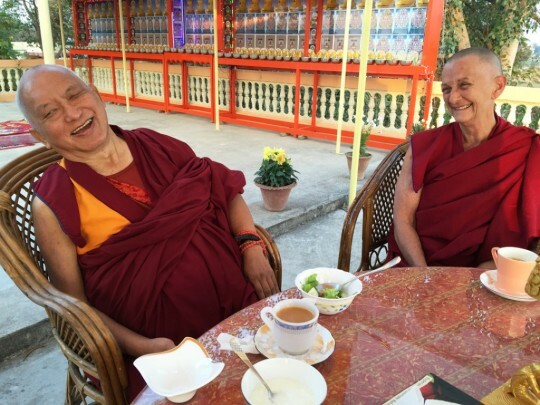 Lama Zopa Rinpoche having tea with Ven. Thubten Labdron (Trisha Donelly) at Root Institute, India, February 2015. Photo by Ven. Roger Kunsang. The countless FPMT students who had the good fortune to meet Ven. Trisha will remember her as a dedicated Dharma practitioner, a good friend and a wonderful, warm-hearted person. Personally I will always remain grateful for all the help she gave me. Find more Mandala stories on Ven. Thubten Labrdon (Trisha Donnelly).